Red bean plants famous as a source of vegetable protein, because its role in efforts to improve nutrition is very important. 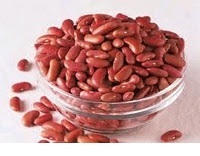 In addition to the rich in protein, red bean are also a source of carbohydrates, minerals and vitamins. The content of vitamin per 100 g of seeds is: Vitamin A 30 SI, thiamine / vitamin B1 0.5 mg, riboflavin / vitamin B2 0.2 mg, and 2.2 mg niacin. Nutrient content in the red beans are very good for the health of the human body. Red bean prevent cholesterol, Dry red beans are a source of vegetable protein, complex carbohydrates, fiber, vitamins B, folasin, thiamine, calcium, phosphorus, and iron. Folasin are essential nutrients that can reduce the risk of damage to blood vessels. Red bean contain fats and sodium is very low, almost free of saturated fat, and free cholesterol. In addition, red beans are also a good source of fiber. In 100 grams of dried red beans, can produce 4 grams of fiber which consists of water-soluble fiber and insoluble fiber water. Water-soluble fiber can significantly lower cholesterol and blood sugar levels. 1. Prevent cholesterol and improving digestion (anti-constipation). High fiber content of fermented in the colon and produce fatty acids of short-chain, which may inhibit hepatic cholesterol synthesis. 2. Preventing the risk of diabetes because the content of complex carbohydrates and low glycemic index include sluggish digestion. 3. Helps maturation of red blood cells, helps the synthesis of DNA and RNA, as well as lower levels of homocysteine in the arteries (thus reducing the risk of heart disease). 4. Helping the diet because fiber will make you feel full and also very low calories. In addition, the vegetable protein content useful for the development of body muscle mass. 5. keeping the nervous system function, carbohydrate metabolism, and prevent the disease beriberi. 6. Helps metabolize amino acids, fatty acids, lipids, gluconeogenesis, synthesis of neurotransmitters, histamine synthesis, hemoglobin synthesis and function and maintaining healthy skin. 7. Assist the process of blood clotting in the wound. To get the perfect efficacy of red beans, there are some things that need to be done in the process. After soaking, discard the soaking water red beans. Then boil the red beans in a covered pan for 3 minutes, and let stand for 2 hours so the juices settle. Replace the water bath with water boiled, and let stand overnight. The next day, red beans ready to be cooked into a delicious meal. This needs to be done to eliminate the ability of red beans to produce gas in the gut that will make the stomach feel bloated.